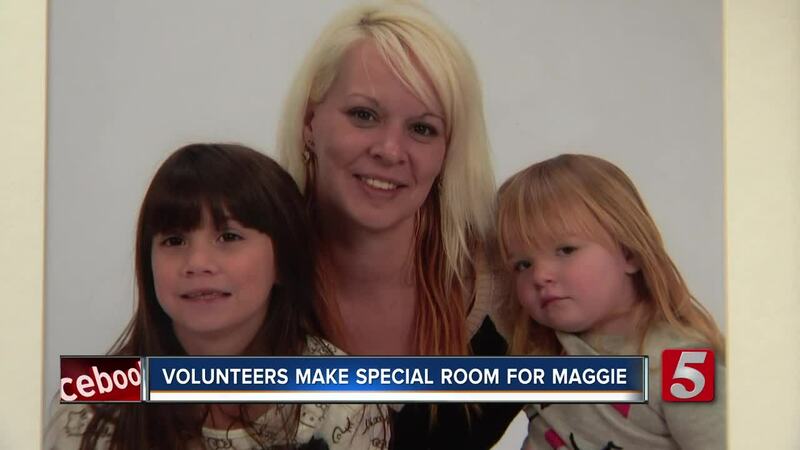 Volunteers have been working to make a room perfect for a 7-year-old girl who lost her mom in a car crash. Maggie Hollandsworth survived the crash after spending 120 days at Vanderbilt University Medical Center. "She had a 40 percent chance to breathe on her own and move her upper extremities, and she beat them all," Nelson Hollandsworth said. Maggie now has to use a wheelchair, so a non-profit called Tucker's House built on to her grandparents' home to help make it accessible. "So Maggie enters directly into her bathroom addition space, and as you can see, it's really enlarged so she has a lot of room to navigate with both her power chair and her shower chair," Sandra Zaccari said. "My niece who is a girl scout has unbeknownst to me shared with the girl scouts for her service project which was to redo Maggie's bedroom for her," Zaccari said. Maggie's room has a butterfly theme with pink walls -- her favorite. "I'm super excited," Maggie said. As the room slowly comes together, Maggie's family is grateful for the community that's rallying around a little girl who's been handed some tough cards. "Makes you want to buy more girl scout cookies," Hollandsworth said. Maggie gets to move in to her new room in about two weeks. If you would like to be a corporate sponsor or help donate to Tucker's House, you can learn more here .